G.P. Putnam's Sons, 9780425243619, 528pp. Husband-and-wife treasure hunters Sam and Remi Fargo run afoul of a dangerous dictator in this adventure in the #1 New York Times-bestselling series. 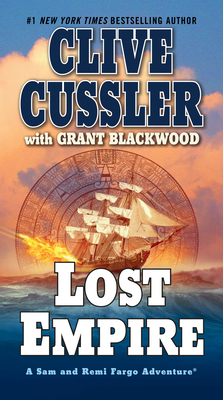 While scuba diving in Tanzania, Sam and Remi Fargo come upon a relic belonging to a long-lost Confederate ship. An anomaly about the relic sets them off chasing a mystery—but unknown to them, a much more powerful force is engaged in the same chase. Mexico’s ruling party, the ultranationalist Mexica Tenochca, is intent on finding that artifact as well, because it contains a secret that could destroy the party utterly. Through Tanzania and Zanzibar, into the rainforests of Madagascar, and across the Indian Ocean to Indonesia and the legendary site of the 1883 Krakatoa explosion, the Fargos and their ruthless opponents pursue the hunt—but only one can win. And the penalty for failure is death. Grant Blackwood is the author of the Briggs Tanner series, as well as the coauthor of #1 New York Times bestseller Dead or Alive, with Tom Clancy, and The Kill Switch, with James Rollins. A U.S. Navy veteran, he spent three years on active duty aboard the guided missile frigate USS Ford as an Operations Specialist and a Pilot Rescue Swimmer. He caught the fiction-writing bug at the age of eighteen while reading Clive Cussler’s The Mediterranean Caper.